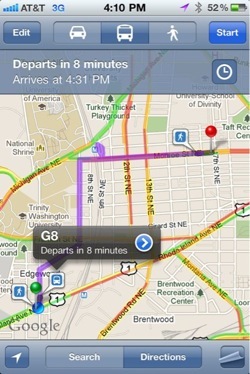 Finally, you can use Google Maps, on your mobile devices or your computers, to navigate the wilds of WMATA transportation. WMATA flipped the switch this afternoon shortly after they announced a media availability with Google after their board of directors tomorrow. I talked about why google maps matters, especially in the context of tourism, last month, and I’m very glad to see WMATA finally get their act together in bringing their data to Google Maps. If you used to make the excuse “Well, I don’t how to get there on public transportation,” now you have one less excuse to take transit less and drive more.